Built back in 1883, the Day Block building was once owned by Leonard Day, a local flour milling and lumber industry entrepreneur. Fast forward a few years - a hundred or so, and you will find Day Block Brewing Company. This brewpub now sits at the former cornerstone of some of the most influential flour mills. 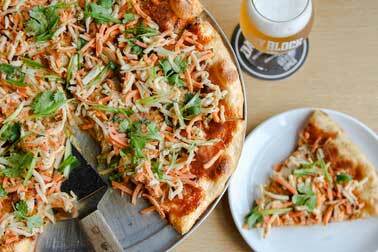 It was only fitting that Minneapolis's best pizza emerged. What Makes our Pizza the best? We seek out producers that can meet our standards: organic, sustainable manner, raised with care & respect. Each individual flavor is taken into consideration, whether it's cooked or simply added on top. Bringing in flavors that can be versatile on many dishes is our goal. Luckily in Minnesota, it’s fairly easy to find local, organically or equivalent produced ingredients that follow our Triple Green Strategy. 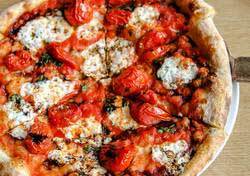 The secret to the best pizza in Minneapolis starts with the dough. We use a combination of ambient and cold fermentation techniques in each ball of dough. Our ingredients are simple: flour, water, salt & yeast - that's it. A top-secret blend of flours gives our dough the "chew and pull" every pizza aficionado looks for with a bit more crispiness than Neapolitan style pizzas but lighter than most New York style. There's a visible difference between rolled and hand-stretched. Airy, crisp and full of holes - that's how you know it's been stretched by hand to perfection. Those blistering and variations in color are a true testament to how we do pizza. 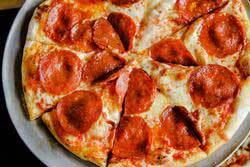 Most pizzerias use classic Italian flavors on their pizzas. We also use classic flavors but draw inspiration from all the myriad of food cultures represented in Minnesota. What sets us apart are the Latin American, Vietnamese, Scandinavian, North African, Eastern European, Japanese, American and many other influences that guide our pizza making direction every day. 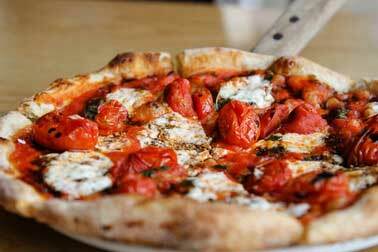 Many of our pizza inspirations come from a great meal eaten at one of the many restaurants in our community. 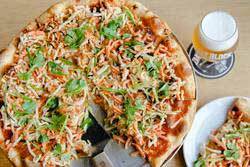 "I went there and ordered a kolsch then the pizza Leviathan caught my eye. You will drink a lot of beer to finish your pizza, but yeah this is why you are here for. (and beer is reasonably priced)..
Did they convince you yet? Make a reservation, pizza is waiting for you. Southern comfort meets Minnesota nice. 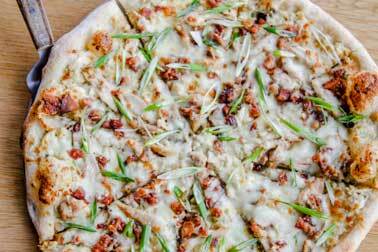 Let your inner Devil Chicken roam with Minneapolis's only Pollo Diablo Pizza! The most down-to-earth pizza you've ever tasted. Take a ride on the Midwestern side. Looking for an Asian twist? K, we’ll make the flavors pop. Taco-bout a pizza with flavor that’ll hit you like a truck. We've got pizzas even for the pickiest of picky eaters. You decide what goes on your pie. Mind your own biscuits and life will be gravy...with this Sunday morning pie. Make 'merica great again, one pizza at a time. 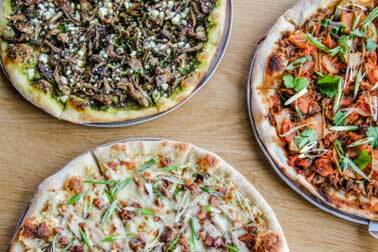 Stop by for our pizza downtown Minneapolis to get the true Minnesotan experience. Whether your attending a show at the Guthrie Theater a few blocks away or heading to the Stadium down the street, we've got options for you and your family. Make your reservation today!